Patrick Brown has been practicing for over 20 years and has dedicated his career to helping those who suffer serious and catastrophic personal injuries as well as those families who have lost a loved one due to the fault of another. He has cases throughout Ontario and is a leader in the area of personal injury law. 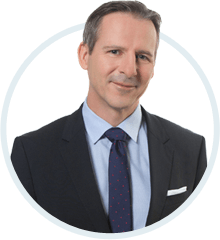 Patrick Brown is a principal partner of the firm and has been practicing personal injury in Ontario for over 20 years. His cases have involved children, spinal cord injury, traumatic brain injury, wrongful death, biking/cycling injury, daycare and camp negligence, drowning, road disrepair and motor vehicle collisions. He is one of a select set of lawyers in Ontario who is a Certified Specialist with the Law Society and has been voted by his fellow lawyers and listed in Best Lawyers Canada and Lexpert Lawyer Rankings. He was recently awarded the Active Transportation Champion of the Year Award by TCAT for his advocacy work with pedestrians and cyclists. In 2012 he was awarded the Distinguished Service Award by the Ontario Trial Lawyers Association and is their Past President. When not working, he enjoys spending time with his wife and two daughters, cycling and playing hockey. During his career he has successfully conducted jury and non-jury trials and has been recognized for his advocacy skills. After successfully obtaining the jury verdict in the case of Ishoy v. Abreau, which involved a five time Olympian who was seriously injured, the trial judge stated “counsel presented their case in a focused, well organized fashion. Their trial preparation resulted in well prepared and focused witnesses. The charts, aerial photographs, medical illustrations, and demonstrative evidence both assisted the jury in understanding the medical and liability issues…Mr. Brown was lead counsel …his closing address to the jury was dramatic, focused and effective.” After obtaining a multi-million dollar award in Roberts v. Morana, a case involving road disrepair, Justice O’Brien noted “I have not seen a case which has been better prepared or presented than this one.” His advocacy skills have assisted Patrick in ensuring his clients are awarded fair and reasonable awards. Patrick was appointed by the Office of the Chief Coroner of Ontario as an expert to the Ontario Coroners 4 Year Review on Cycling Deaths. He was selected to provide legal insight and expertise on ways to prevent cycling deaths within Ontario while representing the interests of cycling organizations such as CycleToronto, ARC, 8-80 Cities, and the United Senior Citizens of Ontario. When the Bike Law Network expanded to represent Canadian cyclists, Patrick joined as the representation for Canada in Bicycle Injury Cases. In addition, Patrick has extensive experience advocating for those suffering from hospital negligence and medical malpractice, including birthing and obstetrical trauma, surgical mistakes, and pharmaceutical trauma. As a leader in his field, he has taught advocacy for legal associations and the Law Society and has been widely published within Canada Law Books and legal magazines. He has been a guest speaker across Canada and has been appeared on television and talk radio including Canada AM, CBC News, CP24, CTV News, Global Morning Show, CityTV News, CFTO, Le Drew Live, Goldhawk Fights Back, John Moore Show 1010, Dave Agar Show 1010, Live Drive John Tory, Moose FM, 680 and other talk radio shows in the province. He Chaired the Trial Lawyers for Veterans which provided free legal advice to disabled veterans returning to Canada from oversea conflicts. He also started and continues the annual Toronto Helmet on Kids program where he and his firm have donated over a thousand helmets to children across Toronto to reduce head injuries. He was Co-Chair with Dr. Charles Tator for Concussion Ontario on their Recognition and Awareness Committee which seeks to prevent the impact of concussions within team sports. He is a former director and founding member of CycleToronto, a proud member of Bikelaw and the Chair of the Ontario Safety League. He is the Past Chair with the Ontario Bar Associations Insurance Law Section. He frequently attends at Queens Park and Government Ministries regarding legislative reform and consultation. Eva Ravikovich Panfilova & Ministry of Education – wrongful daycare death of 2 year old Eva Ravikovich who died in illegal over crowded daycare. This is first case in Ontario against a government ministry for its failure in carrying out their duties to children in daycares. McAdam v. Blue Mountain – multi million dollar biking suit regarding 13 year old boy who suffered spinal cord injury . The award is subject to a confidentiality clause. Holtz and the estate of Ryan Carriere v Picanco – successful wrongful death case of Ryan Carriere who was biking home in Toronto to his family. Case lead to the Ontario Coroners Review 4 year review on cycling deaths and multiple changes to improve road safety for cyclists and pedestrians. B. v. Urban Promise– successful wrongful death of an eight year old boy who drowned at Woodbine Beach during camp excursion. Blog: Safer Streets: Where are we now? Toronto Star: Can a driver killing a pedestrian ever be put down to a ‘momentary lapse’ in concentration? Blog: How Do I Know if I Need a Personal Injury Lawyer? Metro: Do Toronto police need breathalyzers for pot? Global News: What happens next in the scaffolding accident investigation? Law Times: Will distracted driving crackdown suffice? P. Brown, Chair, Litigating Personal Injury Damages, Canadian Institute, February 20 and 21, 2007, Toronto, Ontario. P. Brown, Chair, Insight Information, Litigating Catastrophic Disability Damages, [St. Andrew’s Club and Conference Centre, Toronto, Ontario, December 3 and 4 th, 2006.